Interior Design for Kids: Interview with Jerry Brown Jr.
School Climate: How do we assess it before your child begins school? Eating with braces on your teeth is hardly an experience that is likely to be categorized as ‘pleasant’. I mean, who wouldn’t feel a bit restrained by having some metal in their mouths? However, a little restraint and discipline on eating habits can bring you the bright smile with a lot more ease, especially during the first few weeks of getting your braces through orthodontic treatment. Eating with braces- what can you eat? Your diet affects your oral health and the intake of sugary foods altogether as food debris can get stuck in your teeth while eating with braces. Sugar from these foods mixes with the plaque on your teeth to create acid which damages the enamel layer of your teeth. The more sugar you consume the more sugar eats away at your tooth enamel. The acid can create white spots on your teeth that can be permanent and possible lead to cavities. Braces have been designed to straighten your teeth out and keep them healthy. Also Read: Is your child onto an obsessive habit? Eat soft, well-cooked, easily-digestible foods: Eg: Fruits, steamed vegetables, soft foods like idlis and dosas, dairy products, eggs, etc. Avoid: Sticky or chewy food, hard and crunchy foods Eg: Pizza, candies, chips, popcorn, etc. One of the biggest dangers to your brackets and wire braces is the way that you consume your food. The best way to avoid having to bite into anything is by cutting your food into smaller pieces. This can help you limit the amount of biting and chewing your teeth will have to do. You should still try and cut your food into smaller pieces even if you’re eating braces-friendly foods. This will help you better manage the pain and protect your teeth and braces against any damage. Bite with the side of your mouth and avoid biting into anything with your front teeth for a while till the pain subsides. 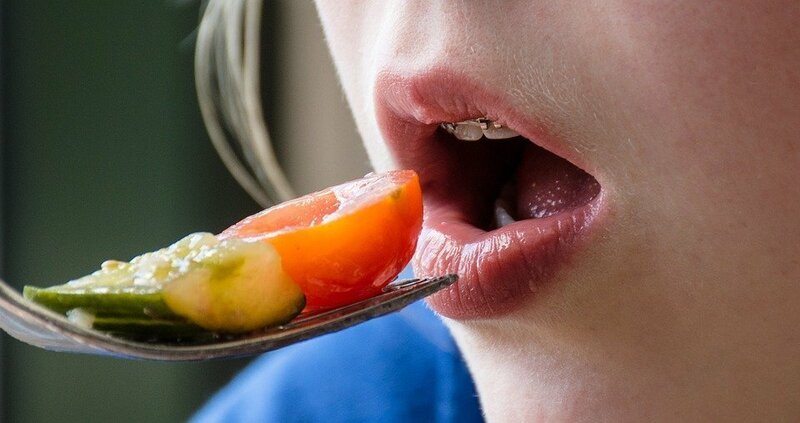 You should get used to biting into food with the side of your mouth. Foods like sandwich wraps can contain hidden chunks of meat or vegetables which can get stuck in your front brackets so bite carefully into these types of foods or choose to eat with fork and knife instead. It is vital that your teeth remain clean after you finish eating, this is doubly important when eating with braces. Make sure that you brush and floss your teeth after your meals to ensure that no food scraps and debris get stuck in the tiny spaces between your teeth and spaces between your braces. Flossing may initially seem a bit difficult to do due to all the wires and brackets in your mouth. Lack of proper cleaning can lead to your teeth becoming damaged, especially if food is left on them for extended periods of time. If eating becomes too difficult for you due to poking mouth brackets or mouth sores, apply a lot of dental silicone and dental wax. The initial first few weeks of getting braces are difficult but after a while, your braces toughen up with scar tissue. Within a few months of wearing braces, you’ll be able to eat crunchy foods again and wearing braces won’t be so painful anymore. As the founder of Putnam Orthodontics, Dr Satish Pai is dedicated to not only creating perfect smiles for his patients but also educating people about everything related to oral health. When he is not doctoring lovely smiles on his patients, you can find him golfing, surfing, doing yoga or goofing around with his family.